When I was in Junior High School I took a Home Economics Class. For half of the school year we learned how to sew and for the other half we were taught cooking. The Home Ec classroom had several kitchens where, in small groups, we cooked a complete meal, including dessert. It was a fun class and I still have my Home Economics cookbook, "Recipes for Young Homemakers" Selected by Manitoba Suburban Home Economic Teachers. Because the recipes in this cookbook were written for students with very little cooking knowledge, they are easy to follow and they work. One recipe from this book that I still like to make is called a Lazy Daisy Cake. Probably so named because if you're feeling a little lazy, or in a rush, this cake is easy to make, uses everyday ingredients, and it tastes so good. A Lazy Daisy Cake is composed of a Hot Milk Sponge Cake that is topped with a Broiled Frosting. It is a 'pan cake' or a 'snacking cake', which means, it's not meant to be unmolded, you just cut and serve the cake right from the pan. Now, a Hot Milk Sponge Cake is a cross between a Genoise and an American sponge cake. That is, the whole eggs (both yolks and whites) are beaten with the sugar until thick (like a genoise), and then the flour is added. We do add some baking powder (like an American Sponge) to help the cake rise. The milk and butter are warmed until hot so that the butter stays melted and the mixture can be easily incorporated into the cake batter. This is a cake that is relatively foolproof which makes it a good cake for beginners. 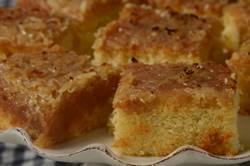 It also produces a very nice tasting cake with a light and fluffy texture and soft and tender open crumb. The cake is topped with a Broiled Frosting. What's unique is that shortly after the cake comes out of the oven, you pour the frosting onto the still warm cake and then place it under the broiler until it becomes all bubbling and brown (hence the name "broiled" frosting). Broiling the frosting turns it a beautiful golden brown color and makes it nice and crispy. Because it is made with brown sugar is has a caramel-like flavor which goes very nicely with the sweet vanilla flavored cake. Recipes do vary for the frosting. While this frosting just includes dried (sweetened or unsweetened) coconut, you could also add some chopped nuts. Lazy Daisy Cake: Preheat your oven to 350 degrees F (180 degrees C). Butter and flour (or spray with a non stick vegetable/flour spray) an 8 inch (20 cm) square baking pan. In a bowl, sift or whisk together the flour, baking powder, and salt. Meanwhile, in the bowl of your electric mixer, fitted with the paddle attachment (or with a hand mixer), beat the eggs, sugar, and vanilla extract, on medium high speed, until thick, pale yellow, and fluffy. Add the flour mixture and beat until smooth. Scrape down the sides and bottom of the bowl as needed. Add the hot milk mixture and beat only until combined and smooth. Pour the batter into your prepared pan, smoothing the top with an offset spatula or the back of a spoon. Bake for about 25 - 30 minutes, or until a toothpick inserted into the middle of the cake comes out clean. (The cake will have risen, turned a beautiful golden brown, and is just beginning to pull away from the sides of the pan.) Remove from the oven and place on a wire rack. While the cake is baking prepare the Broiled Frosting. Place all the frosting ingredients (except the coconut) in a small saucepan and stir, over medium heat, until melted and the mixture just comes to a boil. Remove from heat and stir in the coconut. Immediately pour the hot frosting over the warm baked cake. Then place the cake under the broiler until the frosting is bubbling and brown. Watch carefully so it doesn't burn.